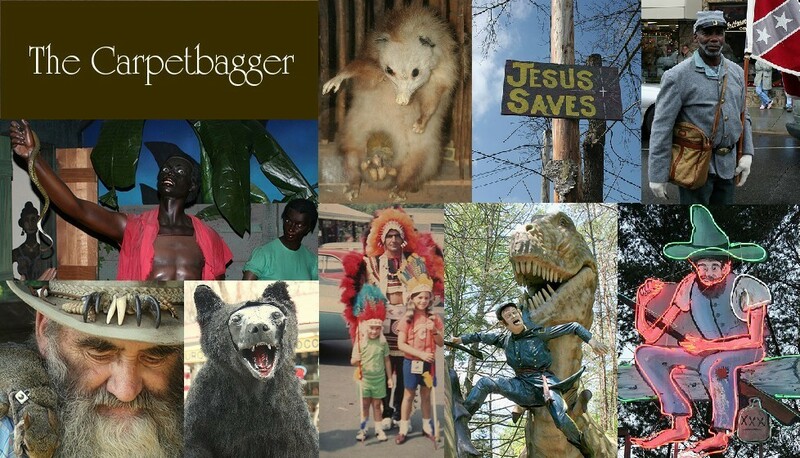 In 2009 I had a great time sampling the Bible Belt's collection of alternative Halloween celebrations. I went to my first Christian Haunted House. I attended the Devil's Funeral. 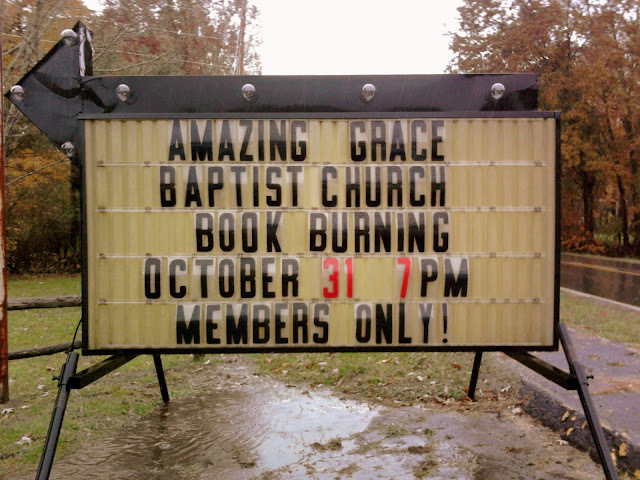 But the strangest event I attended was unquestionably the Halloween Bible Burning in Canton, NC. What!?! Burning bibles in the South? Who would do such a sacrilegious thing? Baptist Preacher Marc Grizzard, that's who. Here is a photo of Grizzard from his very own facebook page. 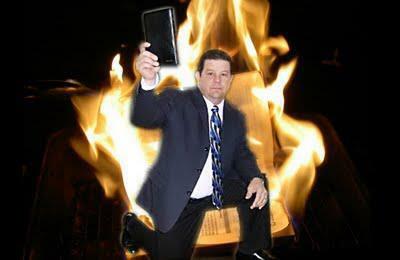 So why would a baptist preacher burn bibles? Grizzard felt that the ONLY Bible was the King James Version and all other interpretations are blasphemy. He even denounced other Christian books, including anything by Billy Graham, going as far as calling Graham a heretic. 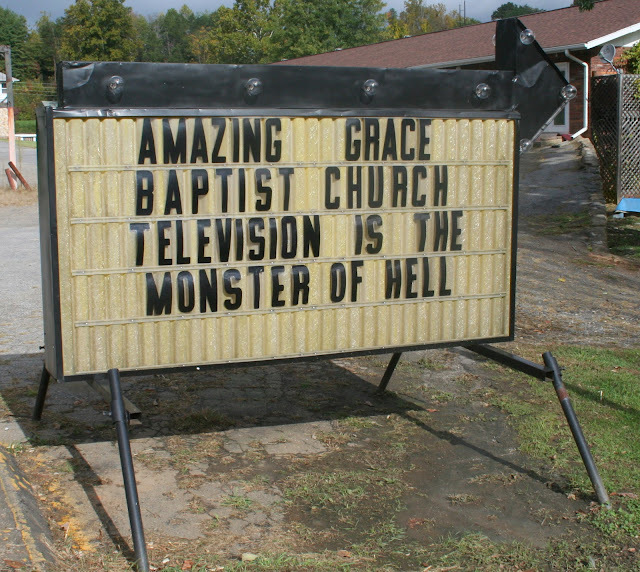 The sign outside Grizzard's church always had something interesting plastered on it. Grizzard set off alarms all over the place when he declared that he was intending on setting fire to bibles on Halloween. 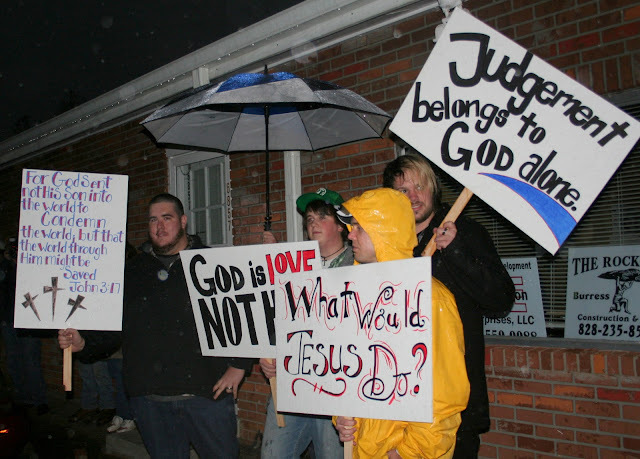 Not surprisingly, this wasn't a mainstream view and this angered quite a few Christians. Quickly the Bible Burning was called off, not because of the negative backlash, but rather the fact that the local fire department reminded Grizzard that burning books was illegal in NC. I guess this legislation was to discourage North Carolina Nazis. Grizzard later decided that he would not be deterred by mortal fireman. Grizzard announced that the Bible Burning was back on, however he forbid any non members from attending. 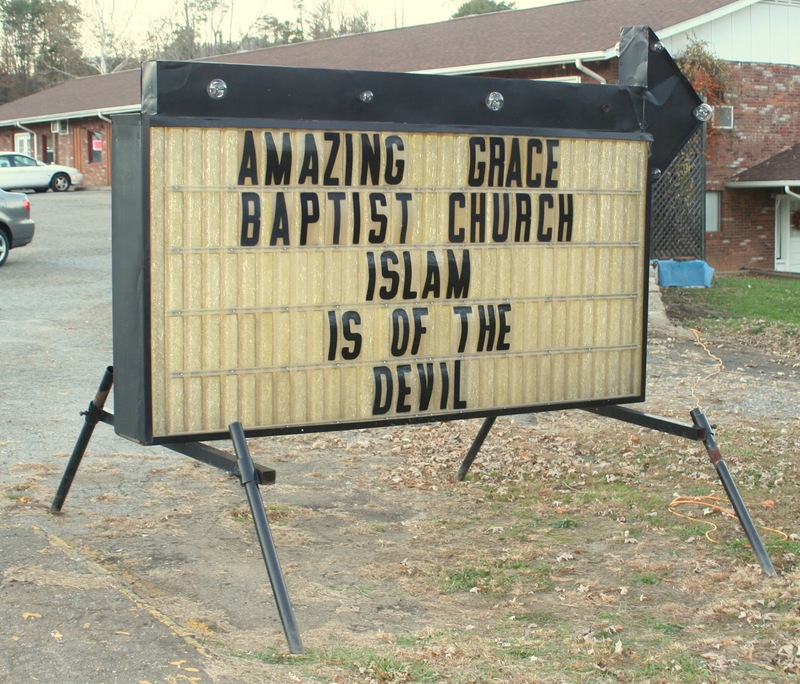 This is possibly the first time in history Christians have told people to not come to church. Of course I had to show up just to see the fireworks. Protestors showed up and declared they were against book burning. It was pouring rain. The irony was not lost on anyone, except for maybe Grizzard, who never made an appearance. 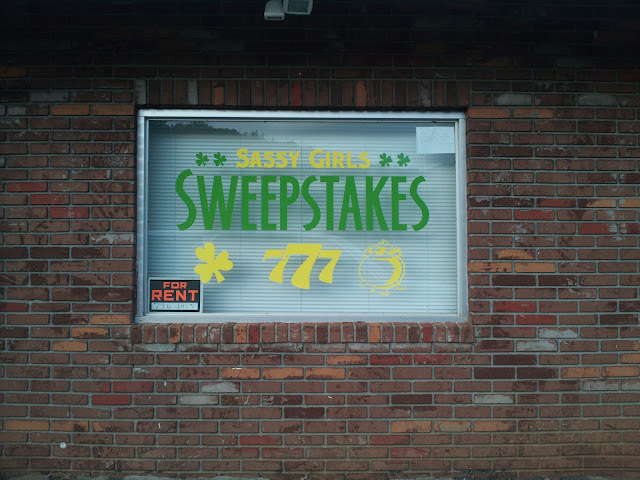 The owners of a neighboring business let people in to try to hear Grizzard through the wall. All that could be heard was garbled fire and brimstone. Of course the real crazy did not start until a Nazi showed up. It turns out that he wasn't a real Nazi, but rather making a statement. Never the less, it sure kicked up the circus-like atmosphere. No one knows if any actual Bible's were burned, there was a rumor that they were shredded instead to keep with local fire code. Grizzard faded into obscurity, appearing occasionally to post something really mean and crazy on his beloved sign. I actually met Grizzard at one point, as he gave me a free CD of self recorded gospel songs at the county fair, but I didn't realize it was him. I never actually listened to the CD.